JACKSONVILLE, Fla. - State legislators in Tallahassee are considering a bill that would block local tree protection ordinances. If the bill becomes law, Jacksonville property owners would no longer have to through a permit process just to cut down or trim a tree. 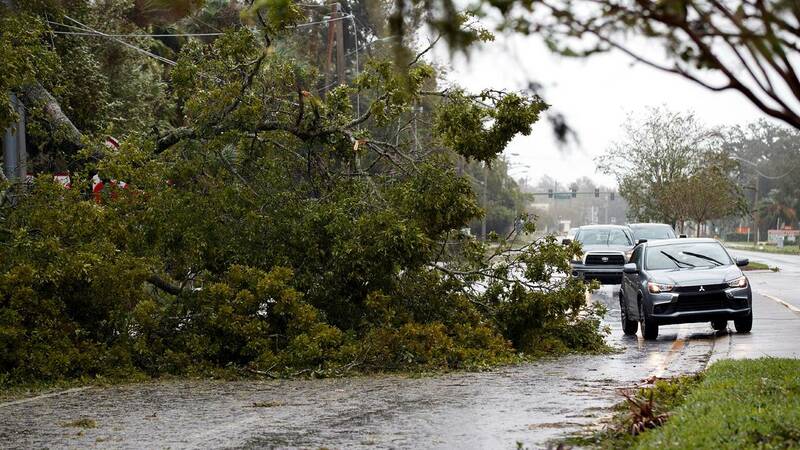 More than three months after Irma's hurricane-force winds uprooted thousands of trees across Jacksonville. Henry Sacerio is still cleaning up. "We had a lot of branches and debris all of the patio and as you can see it tore it to pieces," homeowner​​ Sacerio said. Much of the damage was caused by a wind-whipped tree in his neighbor's yard. "I'd love to have this one cut and the other's trimmed," said Sacerio. But the process isn't easy, because certain trees are protected by a Jacksonville ordinance, therefore, property owners must be permitted by the city to remove, cut or trim certain trees. Democratic state Rep. Katie Edwards wrote a bill in hopes of blocking an local government from regulating the trimming, removal, or harvesting of threes and timber on private property. Senate Bill 574 and House Bill 521 seem like an easy fix that to state ravaged downed trees in Hurricane Irma's wake which led to massive power outages. According to the Jacksonville Electric Authority, tells me 96% of the power outages during Hurricane Irma were caused by downed trees. But one of Florida's most prominent environmental advocacy groups opposes the bills. These bills would preempt to the state regulation of the trimming, removal, or harvesting of trees. If these bills become law, no local government in Florida would have the ability to restrict a landowner in trimming or removing trees. Likewise, no local government in Florida would have the ability to require mitigation for a landowner trimming or removing trees. Trees are an important part of Florida communities. Trees improve the property value of nearby homes and businesses. Trees provide an important cooling affect, especially in urban areas. Trees slow rainwater, helping storm sewers and reducing flood risk. Trees clean air reducing both carbon dioxide and particulate matter. Most significantly, trees have natural beauty providing immeasurable benefit to the people living near them. Whether and how communities regulate tree removal should be a local question. Some communities may choose not to regulate trees because they do not face development pressure or are sparsely developed. Other communities may choose to strictly regulate tree removal because they highly value their tree canopy and would risk losing it without rules to protect it. In any case, each Florida community should be able to consider the benefits of its tree canopy and determine for itself whether and how to protect it. Both SB 574 and HB 521 would ban any local community from making these decisions and instead impose a statewide bar on rules that would protect Florida’s towns’ tree canopies. The bills are currently being reviewed in committee. In the meantime, Sacerio says he plans to continue to painstaking work of removing and rebuilding what he can even with a sense of humor. "I love living here, but I think it's time to move. I'd like to go and rent a little tiny apartment some place and let somebody else worry about," said Sacerio.